His wing is the fan of a lady. "No!" this morning, sir, I say! 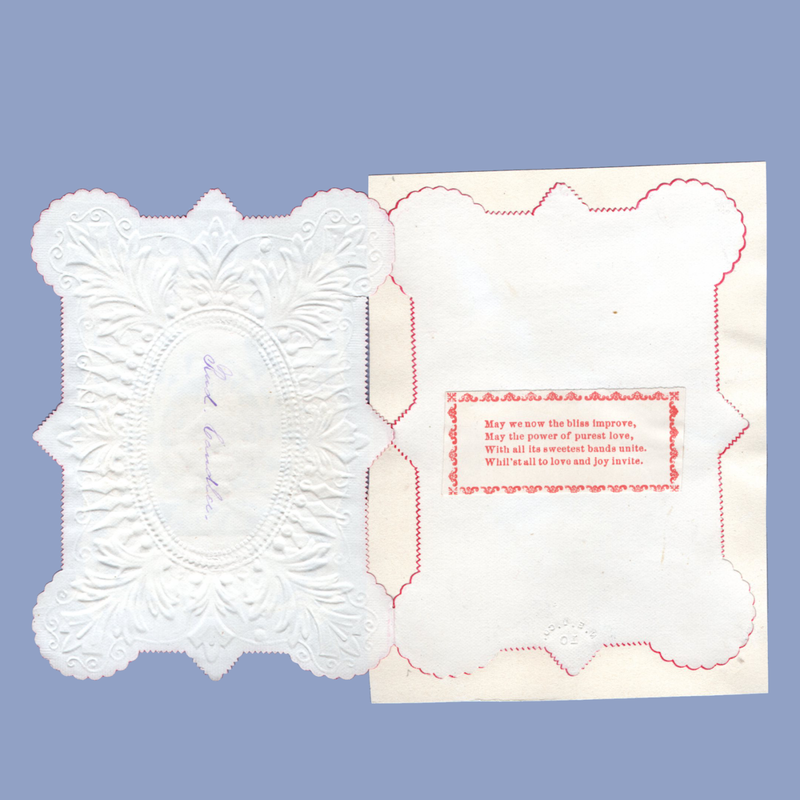 small printed verses for use as a valentine or as a calling/visiting card, which were popular in the 19th century. The credit for these calling cards may more properly lie with Southworth A Howland, father of Esther, who was a printer and stationary store owner. 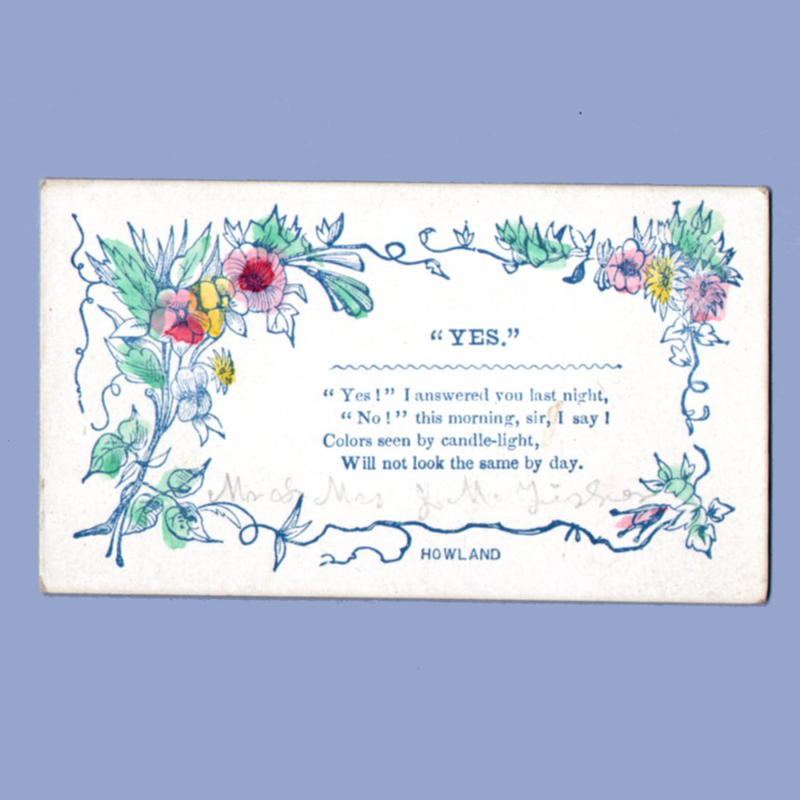 As of the time of this entry I have been unable to find mention of these cards or the pasted in valentine verse that bear the full 'Howland' name (shown below) in any of my sources. 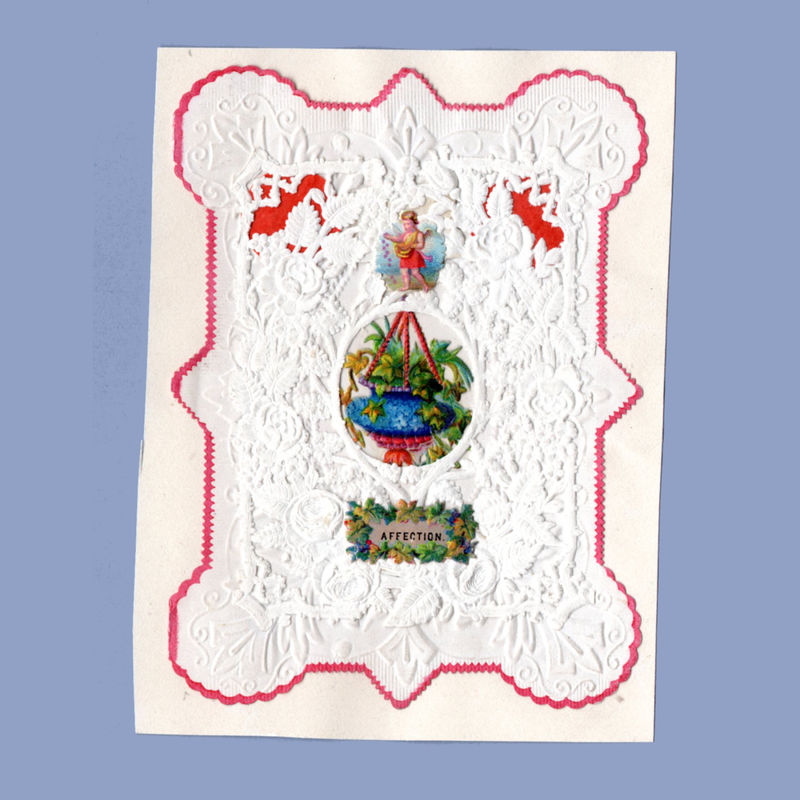 Wafer-Style Decorations on Paper Lace. 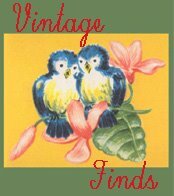 Esther Howland is often credited as the first US manufacturer of valentines. This is not quite true as there were others making valentines, including commercial efforts like Elton and Co (later known as McLoughlin Brothers) and T. W. Strong both of NY, that predate her 1849 beginnings. Those companies' valentine endeavors date to 1833 and 1842, respectively. Both focused on the comic style valentines that were popular in the US at the time. 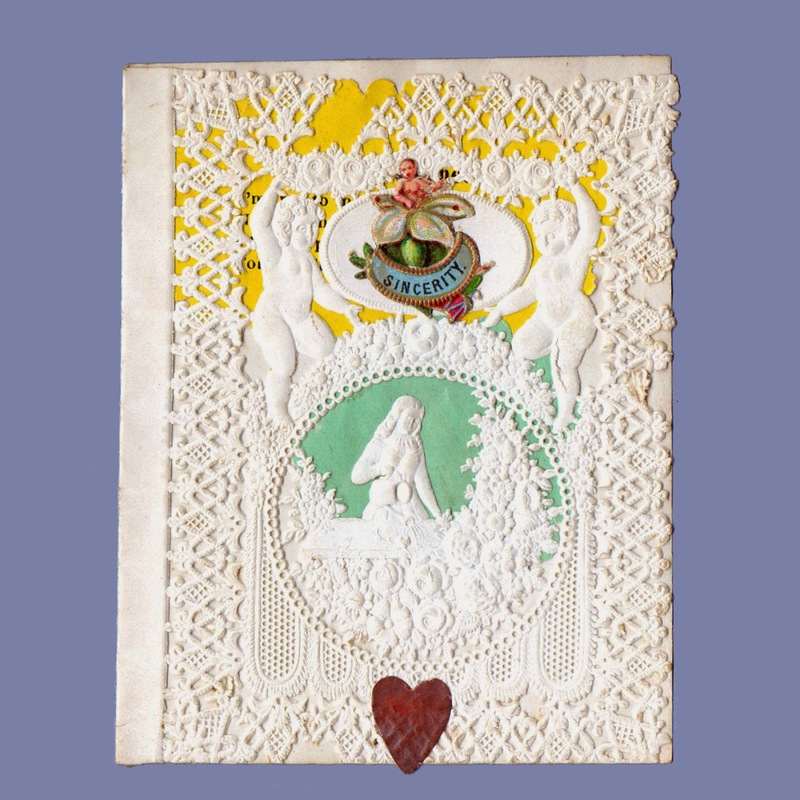 She was, however, the first to make the English-style romantic, hand-decorated cards in a large commercial quantity and probably the first to achieve such an astounding initial success as a valentine maker. 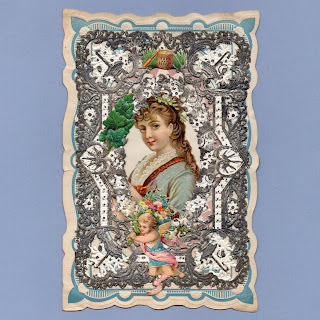 Her cards were put together with paper lace and decorations bought from Europe and competed commercially with imported cards, like the one that first piqued her interest in valentines. That card was sent from England to her father's stationary shop in Worcester, Mass., S. A. Howland and Sons, the same year that Ms. Howland graduated from Mount Holyoke College. Her cards were an instant success, selling around $5000 worth of orders, quite a sum in 1849. While she isn't truly the first US valentine maker, she does have many innovations to her credit. The most important was her assembly-line style of manufacturing which she employed long before Henry Ford ever did. 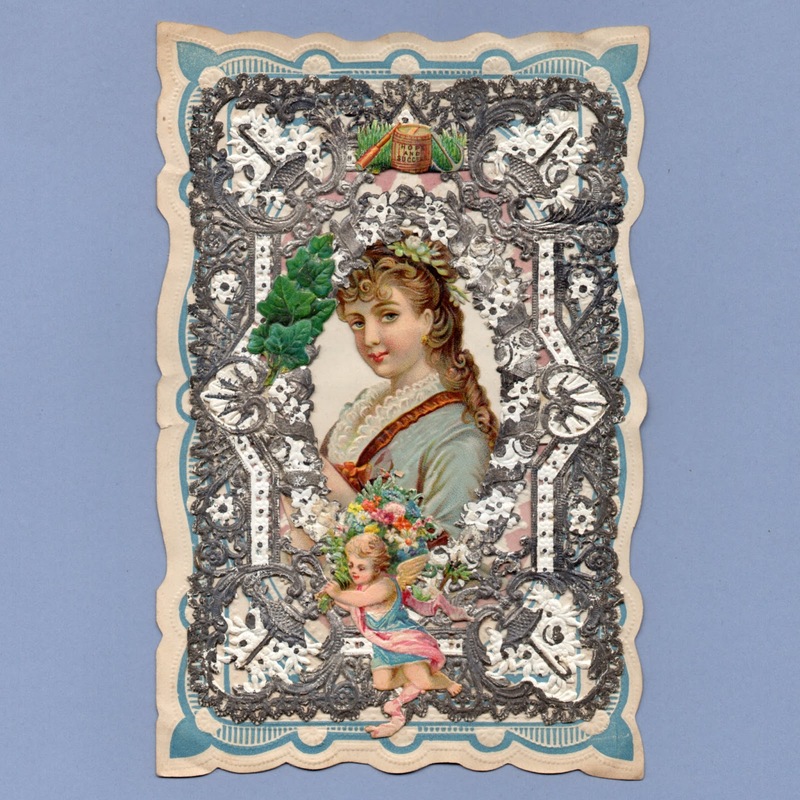 Her other achievements are related more directly to the cards themselves, including creating the wafer-style colored paper backing that can be seen through the paper lace, as employed in our cards. 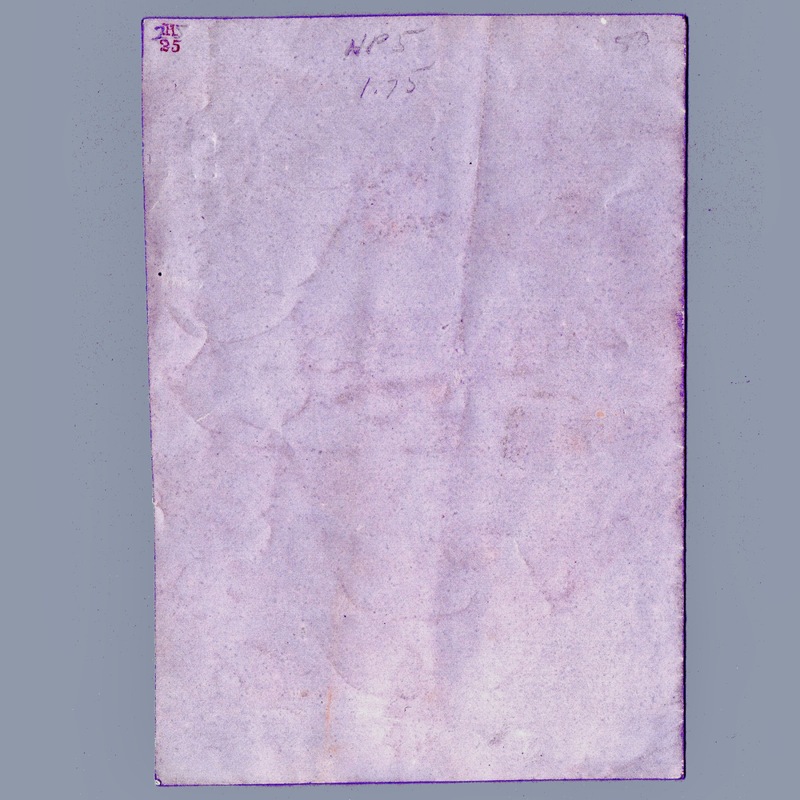 She also was the first to paste verses on the inside of the card (she disliked the look of writing on the card face). Using dies to cut the paper decorations used in her cards was another of her ideas. 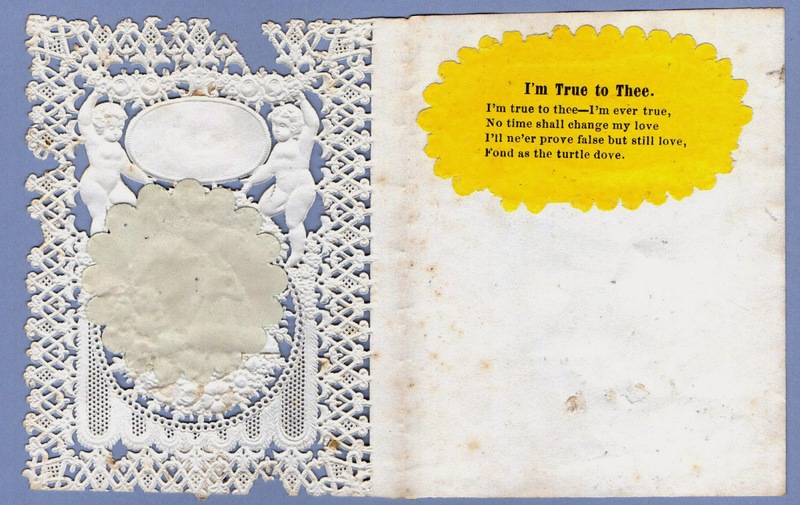 While she is often also credited with coming up with those accordion-folded paper 'springs' to create layers and add depth, these can be found on earlier, religiously themed valentines from the 18th century. 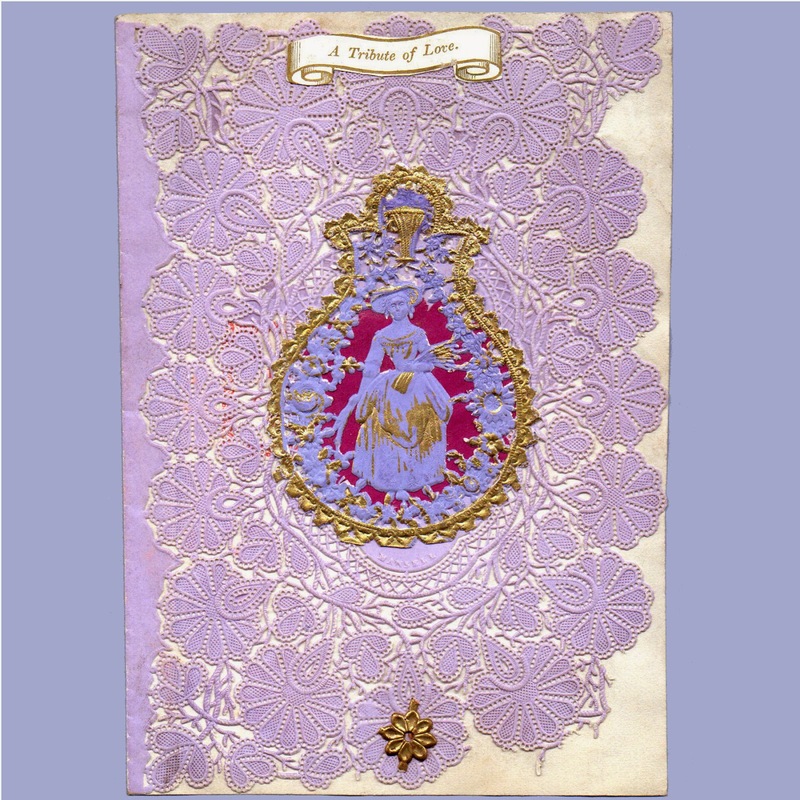 Wafer-style decorations on the back-side of paper lace; Victorian scraps attached to the front-side of the lace with colored paper set behind the lace layer. Most of her cards are believed to have been marked, however not all were. A red letter 'H' was often stamped on the card back. Another style of marking was a small white heart with an 'H' stamped in the center which was pasted on the back. 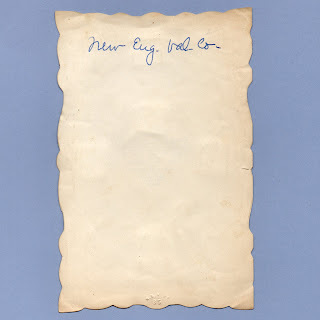 Some later cards bear the New England Valentine Co mark (N.E.V.Co.) she began using in the 1870s. Our top example does not bear a red 'H' nor a N.E.V.Co. mark but the interior, pasted-on verse is marked "Howland" in the lower right. Its paper lace front bears a Berlin and Jones mark on it. That company was based in New York and eventually bought up in 1869 by George C. Whitney and Co who also purchased Ms. Howland's N.E.V.Co sometime before 1881. Berlin and Jones is a company Howland is known to have worked with (as well as Taft, another Worcester valentine maker). When Howland utilized 'blanks' purchased from other makers they often had that maker's mark (seen in the left side margin of the front in both of our examples), often in addition to her own. So cards may have more than one mark, or occasionaly, none at all. Then it can often still be identified as the work of Ms. Howland by looking for other markers like the presence of her 'wafer' decorations or pasted in verse. However, some early Whitney cards are very similar (these were generally marked with a red 'W' employed very much like Howland's red 'H'.) 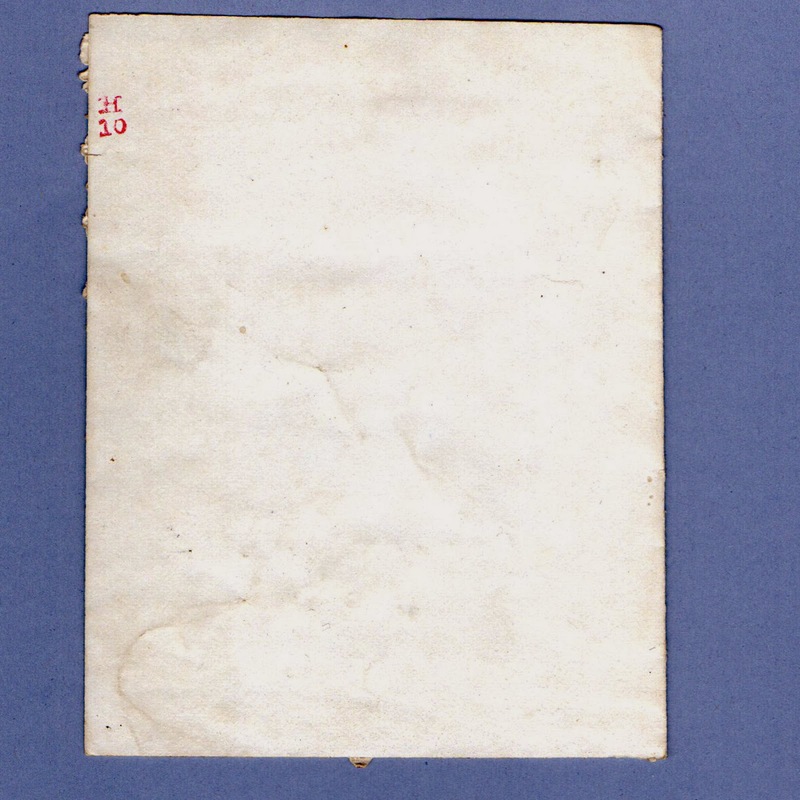 Early cards by the two different makers can be hard to distinguish if no mark was used. 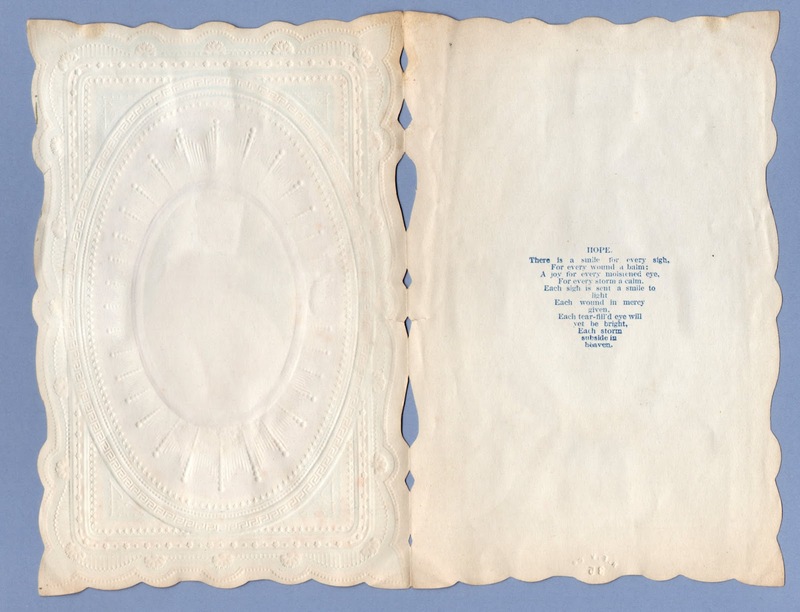 There is also a booklet of verses, The New England Valentine Co.'s Valentine Verse Book for 1879, that was sent to sellers of her valentines. 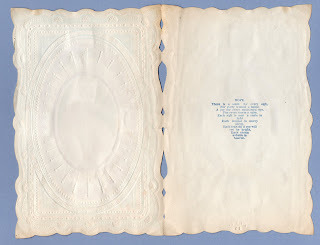 It contained verses printed in red, green, gold and blue and were intended for the buyer who may find a card they like but with a verse that was not suitable. 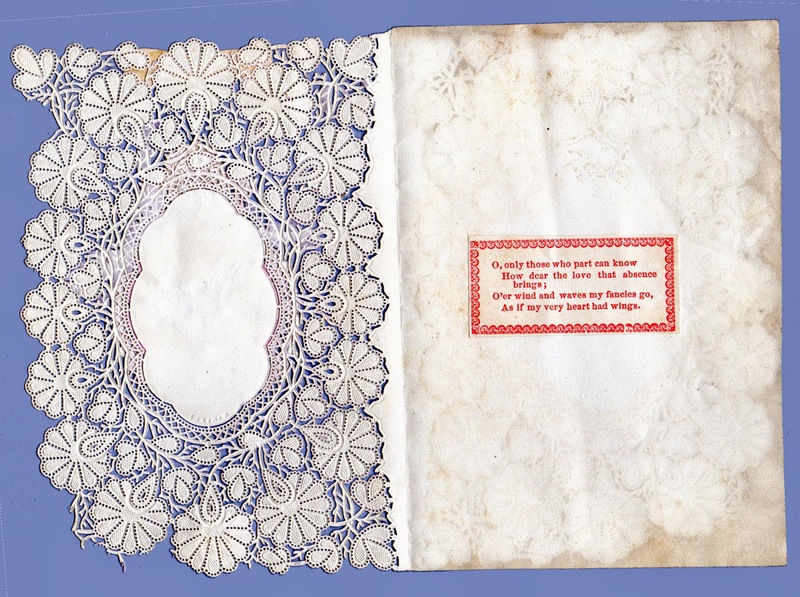 A more appropriate verse could be chosen from the book, cut out and then pasted over the original one appearing in the card. After selling her business to the George C. Whitney Co., Ms. Howland cared for her ailing father until his death in 1882. After his passing, she moved on to Quincy to be with her brother Charles. There she died on March 15, 1904. Much hay has been made of Ms. Howland's 'spinster' status noting the irony of someone who made their name in creating tokens of love remaining unmarried. In my research I've found nothing speaking of her private life beyond her devotion to her father. Any affairs of the heart Ms. Howland may or may not have had remain a mystery. And swear for no longer than this. Red 'H' mark (see close-up below) on back and the Ingram mark suggest this is an earlier card. Herbert Ingram was in London as early the 1840s. William continued the business after his father's untimely death in 1860. 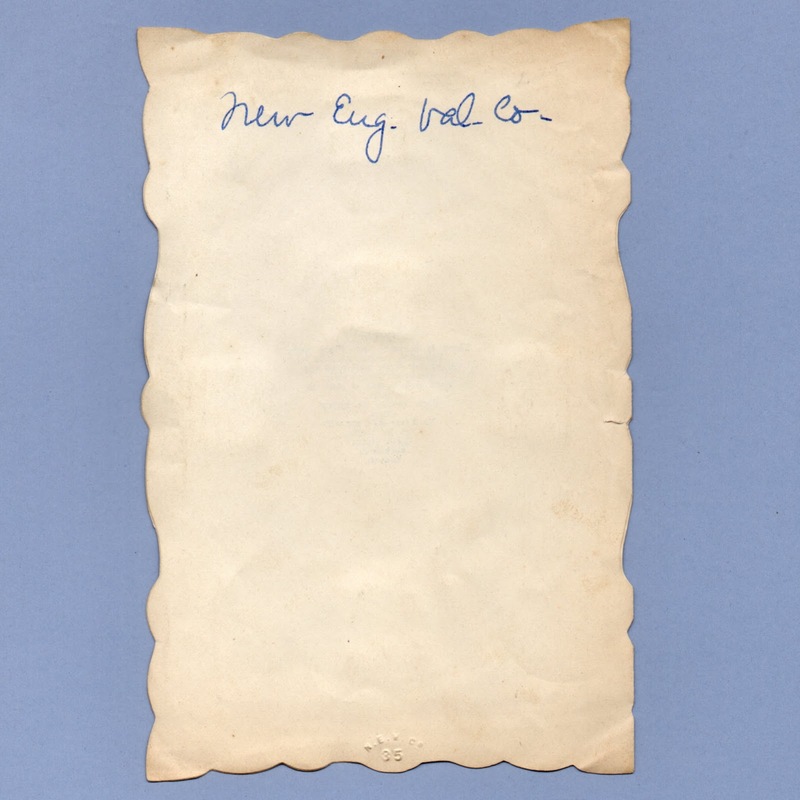 By the 1870s, Howland was using the NEVCO mark. Sincerity ~ I'm True to Thee - I'm true to thee - I'm ever true, No time shall change my love I'll ne'er prove false but still love, Fond as the turtle dove. A Tribute of Love~ O, only those who part can know How dear the love that absense brings; O'er wind and waves my fancies go, As if my very heart had wings. center medallion with gold trim lifts to reveal a floral scrap emblazoned with 'Friendship"
Paper lace is marked "Mansell"
Affection ~ May we now the bliss improve, May the power of purest love, With all its sweetest bands unite. Whil'st all to love an joy invite. Hope - There is a smile for every sigh, For every wound a balm; A joy for every moistened eye, For every storm a calm. Each sigh is sent a smile to light Each wound in mercy given. Each tear-fill'd eye will yet be bright, Each storm subside in heaven.